Making good progress on my Maple Leaf Quilt. I laid out some of my border blocks with the center yesterday so I could see how it’s coming. I love the tiny squares, but am afraid the new blocks pull the eye away from the center. I’m hoping when they are balanced by more blocks, it will all even out. The new border is only going on the two long sides; I need to get this thing closer to square to fit the bed. I do intend to wrap everything with the little row of squares to tie it together, then to use a multi-color fabric I originally intended to use on the back for the final border. From here and via photo, the border *does not* pull away from the center. And although that was a gut reaction, I did go back and figure out why. The color areas in the center are larger, thus more focused, and are BRIGHTER–an effect of both color choices and piece sizing. 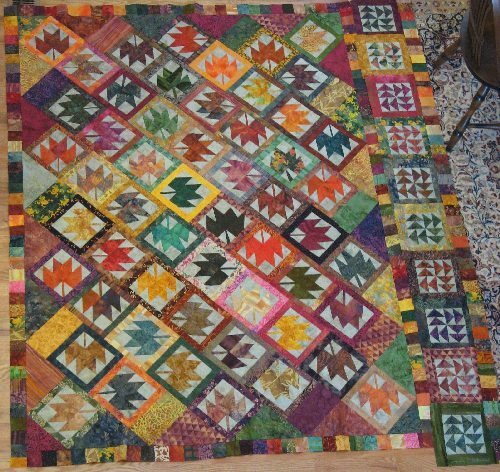 That yellow-framed green leaf and the brightest orange leaves (scattered, but all toward the center of the quilt) create very effect magnets drawing the eye to the center of the work as a whole. The border is like a subtle echo of the center colors and textures, like smaller ripples at the edge of a pond where the rock has been dropped in the center.